Stan Lee and Steve Ditko created an unabashed cultural phenomenon in the AMAZING SPIDER-MAN. Their pitch-perfect blend of Peter Parker’s everyday woes and Spider-Man’s never-say-die adventures was something undeniably special. And after years of perfecting that formula, they unleashed the definitive Spider-Man masterpiece: the Master Planner saga! Putting Spider-Man through the most wrenching experience of his career, Lee and Ditko defined the spirit of a hero that has inspired millions. This Epic Collection has that complete story and so much more in store: the first appearance of Gwen Stacy, Peter Parker’s high-school graduation and landmark battles with the Green Goblin - plus a spellbinding team-up with that other famous Lee/Ditko creation, Doctor Strange! 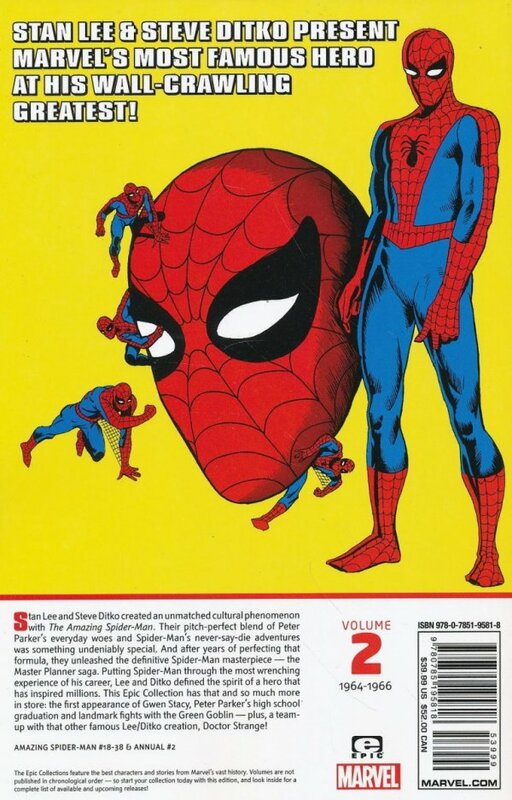 Collecting AMAZING SPIDER-MAN (1963) #18-38 and ANNUAL #2.